When selling old coins it is crucial to know that you are not dealing with inexperienced dealers or untrustworthy pawn shops. You can find many places to sell antique coins, but not all of them guarantee that you’ll receive a truthful assessment of your rare and historic coins. Here, at NYC Bullion, you can be sure you’ll get an honest and worthy exchange for any antique coins. Our certified precious metals dealers will give you a transparent examination of your old coins, making sure you get paid for what they are really worth. Among many other antique coins buyers, we are one of the few that are concerned about giving a pleasant and confident experience to our customers that want to sell old coins. Stop by at our store and get a generous cash payout for your old coins or any collectible coins. Where to Sell Antique Coins? The single and most significant attribute of highly reliable coin shops like NYC Bullion is that you will certainly get a better offer for your antique coins than those which you would receive in pawn shops or local dealers. Why? These companies have financial obligations that do not allow them to pay you more than the value of the precious metal content in your coins. NYC Bullion, on the other hand, is aware of the true value of these historic coins and is ready to pay you significantly more for any antique coin that is worth more than its precious metal content. All you have to do is visit us in Diamond District, in New York City, to get a full and transparent assessment of your historic gold coins or any other old precious metal coin. 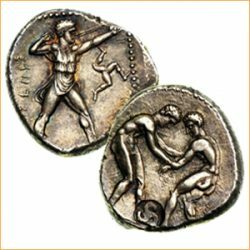 We have a certified and experienced team of professional jewelers that will perform the coin authentication right in front of you and ensure that you receive all the relevant details about your antique coins. If you decide to sell regal coins or any kind of historic coins, just visit us and get a fabulous cash payout for your precious treasure. How to Sell Antique Coins? The first and most important thing to keep in mind about how to sell antique coins is that you should always get a professional authentication from reliable coin shops like NYC Bullion. We are one of the few that will give you an honest and generous offer for your historical coins right in the heart of New York City- in the Diamond District. Visit our store and our top-class professionals will ensure you know the market value of your old coins before selling them. Or, you can choose to find out what you should be getting by accessing our online “Get an offer now” option. In-store or online, you can be sure you’ll get the fairest and most competitive offering if you choose to sell your antique coins to NYC Bullion.